Children's Podiatrist in Perth ? Children’s foot problems should not be ignored, and many can be treated through non-surgical treatment if detected early on. We recommend that any child who complains of foot pain, has difficulty walking or running, or has a family history of foot problems should book an appointment with our Perth foot Specialist to ensure their feet are developing normally. Common children’s podiatry problems we treat include in-toeing and out-toeing, frequent falls, flat feet, in-grown toenails and heel pain. In-toeing and out-toeing are commonly observed in children and may be considered a normal part of gait development up to a certain age. 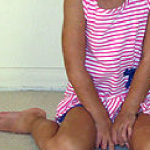 Persistent in-toeing or out-toeing outside of developmental norms should however be assessed in order to identify the underlying cause which may include congenital foot problems such as metatarsus adductus, or torsional problems with the lower limbs or hips. Treatment may include the use of special bracing devices, footwear modifications, orthotics, stretching exercises and surgery. Flat feet are a very common complaint in children and adolescents, and should be assessed by our foot Specialist in order to determine if any treatment is necessary. Although flat feet do not always cause symptoms in children, they are a mechanically poor position for the feet and legs to be in and can result in future foot problems later in life. Most children with flat feet can be treated very successfully through orthotic therapy, which can be arranged through our practice. 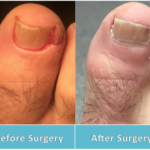 An in-grown toenail is a painful condition that can become infected and may require surgical treatment. It is a very common problem in children and adolescents and may result from improper nail cutting technique, tight-fitting footwear, injury and as a side-effect from certain medications. We treat a large number of in-grown toenails at our practice through both surgical and non-surgical means. For information on ingrown toenail surgery please click here. If your child is suffering from an ingrown toenail we strongly advise having it assessed by our foot Specialist as early treatment can avoid the need to have surgery. Heel pain in children, known as Sever’s disease, can occur during adolescent or pre-adolescent years for a variety of reasons. It is often thought to develop secondary to excessive traction at the site of the growth plate in the heel bone and therefore the onset of symptoms may correspond with a recent growth spurt, or increase in sporting activity. Sever’s disease can be a very painful condition which often does not resolve quickly. If your child complains of heel or arch pain we strongly recommend that you book an appointment to see our foot Specialist for further assessment.